Ayodhya is one the seven mokshadayi puris in Hinduism. Bhagvan Sri Ram was born in Ayodhya. It was also his capital city. But what is the meaning of Ayodhya? Ayodhya means one that cannot be won over in a war. Yuddh means war and A means cannot. It is believed that Ayodhya could not be defeated in war because of the several efficient rulers the land had. According to Skanda Purana, the three letters A, Yo and dhya represents Brahma, Vishnu and Shiva respectively. Ayodhya is situated on the banks of Sarayu River and it was the capital of Kosala. Atharva Veda describes it as a city built by Gods and being as prosperous as paradise itself. It covered an area 96 square miles. Ayodhya is the birth place of Lord Rama, the seventh avatar of Srihari Vishnu. 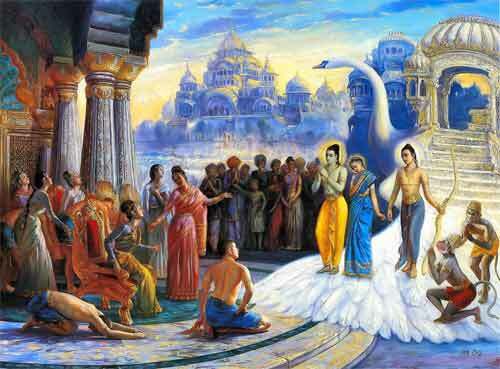 Ramayana the great epic and one of the most important scriptures in Hinduism is based on Rama born at Ayodhya. As per Ramayana, Ayodhya was founded by Vaivasvata Manu, the law-giver in Hindus scriptures. Ikshvaku, the eldest son of Vaivasvata Manu, was the first ruler of Ayodhya. For centuries, the city was the capital of the Surya Dynasty and Bhagavan Sri Ram was the most important king of this dynasty. King Dasharatha, father of Lord Rama, was the 63rd emperor of Ayodhya. Prithu was an important ruler of Ayodhya. Prithvi the name of earth was derived from Prithu, the 6th king of Ayodhya. Some of the important rulers of Ayodhya were Bharat, Harishchandra, Raja Sagar, Mandhatri and Bhagiratha. It is an important pilgrimage center of Hindus. During the time of Buddha the city was known as Ayojjha. The city was an important center of trade during 600 BC. Tulsidas wrote Shri Ramcharitmanas in Ayodhya in 1574 AD. Ayodhya, like many other Hindu cities, were attacked, looted and temples were converted into mosques including the temple at the birth place of Bhagavan Sri Ram. Archaeological evidence shows Ayodhya housed Hindu temples going back to about 2500 years. It is unanimous that a Rama Temple existed in Ayodhya and millions of Hindus sacrificed their lives protecting and in attempting to restore the Bhagavan Sri Ram Temple in Ayodhya.